A fighting position is dug when the unit has time to prepare it or is in a defensive position. Make the fighting position according to Figure 4-4.
a. Position the MK 19 so it is oriented on the center of the assigned sector of fire. Mark the position of the tripod legs and trace the outline of the firing platform, which will be dug about 3 inches deep. b. Dig the position in an "L" shape around the firing platform. 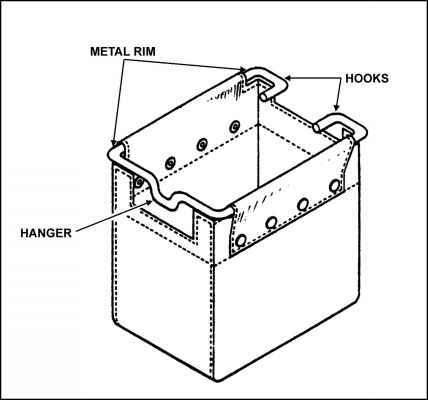 The position should be chest-deep and wide enough to allow the MK 19 crew to load, operate, and place effective fire on an assigned sector of fire. The position can be made so that the gunner can fire from the kneeling position by digging the desired depth directly behind the gun. c. Use the dirt from the hole to build flank parapets 3 feet wide and 1 feet high. 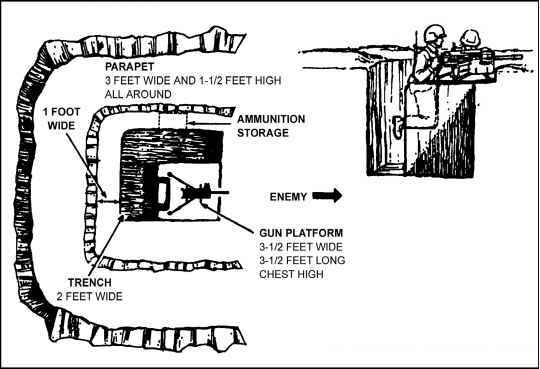 Dig the ammunition storage area into the left wall of the "L" and close to the ground. d. Make sure the wall behind the firing platform is sloped to allow for entrance to and exit from the fighting position. (1) Put flank support logs, 4 to 6 inches in diameter, on top of each other along the entire length of the flank parapets. (2) Put logs, 4 to 6 inches in diameter, side by side across the support logs as the base for the overhead cover. (3) Put a waterproof layer over the base logs. (4) Put 18 inches of dirt on top of the waterproofing material. (5) Mold and camouflage the cover to blend with the terrain. f. Camouflage the position with natural materials such as rocks, logs, live bushes, and grass. How to build a fighting position?